In the beauty business it’s our magic tool and our best weapon. We touch people physically, mentally, and emotionally; many times even spiritually. And while we try to be as clean and sanitary as we can, the salon is a busy place, the day gets hectic, and our power of touch can turn into a dirt and germ spreading fiasco. In fact, cleanliness of the hands is one of the number one topics when it comes to the training of health care and hospital workers. True, we’re not working with solely with the sick, elderly, and other high risk people, but we could really take a page from hospital and health care standard best practices. Here, I want to focus in on what I call ‘high touch’ areas – the places where germs collect, where we touch frequently, and where, with our power of touch, we can make a difference. First, and importantly, wash your hands. Wash with Soap and Water, or use an Alcohol Based hand rub. If you wear re-usable gloves, you will want to wash with your gloves on too. Next, tackle your high touch areas – blow dryer handles, iron handles, brush handles, buzzer and trimmer handles, hand mirrors, knobs and pulls on your station. The easiest way that I’ve found to handle these areas is with Salon Restore’s All Purpose Wipes – they’re big, textured wipes that are bleach-free and perfect for all high touch areas; they lock onto dirt, color, and hair which keeps contaminants from flying into the air. 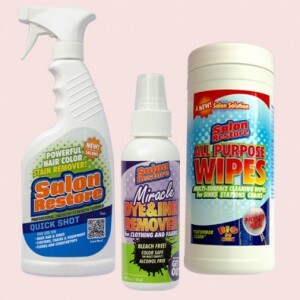 For hair color stains on clothing try Salon Restore Miracle Dye & Ink Remover, and for salon glass and salon mirrors try the new 3-in-1 Desk & Display. You can also use All Purpose Wipes on your carts, chair bases, light switches, door handles, and counter tops too! Last tip – work from clean to dirty. Meaning, if you are going to give everything a once over, start with lightly dirty areas like cabinet knobs, move to your blow dryer handle and other tool handles, and finish with the chair’s base and footrest. Once finished, throw the wipe away and then wash your hands. Use Coupon Code: BOGOFM during the months of February and March 2016 and with ever order of Salon Restore All Purpose Wipes, receive a complimentary bottle of Salon Restore Miracle Dye & Ink Remover (please put both the All Purpose Wipes and Miracle Dye & Ink Remover in your cart, then apply the coupon code and the full amount of the MDIR will come off of the total). Limit 12 per customer. For more, or to send us your favorite “salon best practices” please visit us at www.www.salonrestore.com. If we use your tip we will send you a Salon Restore care package!